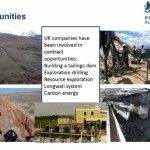 The UK Trade & Investment team Kazakhstan jointly with the British Chamber of Commerce in Kazakhstan and the British Embassy in Astana held on 23 March a webinar on the topic of “Supply Chain Opportunities in Mining Sector of Kazakhstan”. The webinar was organised in anticipation of the UK business delegation at the MINEX Central Asia Mining & Exploration Forum to be held between the 19th and 21st of April 2016 in Astana. 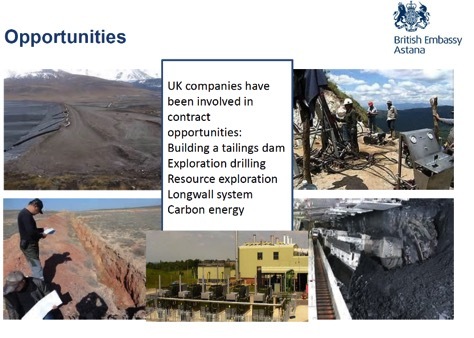 At the webinar the UK trade and investment team discussed the ongoing reforms in the Kazakhstan subsoil use legislation, presented promising investment projects and discussed difficulties faced by the British companies in Kazakhstan’s mining sector. Some of the key issues addressed at the webinar will be presented at the Round table with the Kazakhstan’s officials and companies organised by the British Chamber of Commerce in Kazakhstan on the 20th of April at the Forum. One of the hotly debated topics which concerns many British business is the new mining code which will be adopted at the end of the this year by the Kazakhstan’s Parliament. Presently there is the lack of understanding of how the code will be implemented and how it will replace the present “on subsoil and subsoil use” law. It is particularly unclear how the standards written into the new code are meant to interact with other legislative acts. Gaining access to the national geological exploration data is another pressing question. The Kazakhstan’s authorities earlier suggested that all geological data will be available free of charge with an exception of “state secrets” and “confidential information”. At present, there are no clear definitions of what data is considered confidential and what constitutes a state secret. Besides, despite numerous statements on the availability and easy access to geological information, realistically obtaining reliable data is still problematic or even impossible due to the bureaucratic procedures. One other is issue concerns the local content protective measures. Although in 2015 Kazakhstan has joined the WTO, after which all local content obligations were meant to be removed, foreign companies working in Kazakhstan are still faced with obligations to procure goods and services from the local producers and contractors. Another fact to cause unease among potential investors is that according to the New Mining Code the international arbitration will only deal with contract and licence disputes involving over $50 million USD worth of investments, when everything below that will be dealt with in local courts. Another factor to worry the British enterprises is the regulation rail transportation tariffs by Government which shall be looked at from a macro perspective to ensure government support of the mining industry. Proposed by the Kazakhstan’s Government implementation of new technologies under “Industry 4.0” concept risks clashing with local governments’ staunch desire to protect work places. Finally, the foreign investors still want some solid guarantees of their investments’ safety clearly spelled out. Despite these concerns, the experts agreed that the British companies interested in developing business in Kazakhstan have opportunities in almost any mining sub-sector be it exploration, engineering, consulting, supplying equipment or staff training. To build a successful business in Kazakhstan, the UK trade and investment team urges British companies to develop relationships with the local partners e.g. state-owned companies such as Kazgeology and Tau-Ken Samruk. Among the advantages of Kazakhstan the organisers named a well-qualified population, high geological potential and the ease of access to large neighboring markets due to the development of the “One Road – One belt” economic initiative. The organisers presented the Shalkiya project as an example of an attractive investment as well as supply chain potential opportunities Shalkia obtained EBRD funding at the amount of 460 million USD in order to expand the field. Two more projects of interest are the polymetallic mine Alaigyr and the Tymlay ore field. The cost of developing the Tymlay ore field project is estimated at around 2.3 billion USD. The C1 reserves equal 228 mln tn. In contrast to the information presented by the UK team, the information about the Tymlay ore field on Kazakhstan’s Geology Committee site reports that the titanium dioxide reserves at Tymlay ore field “are small with 238,8 thousand tones of reserves and the site being in need of further exploration”. The disclosure of reliable geological information is a clearly one of the key priorities if Kazakhstan wants to attract foreign investors. This creates opportunities for widening cooperation with the British geological companies and experts. The upcoming MINEX Central Asia forum in Astana will feature a session “Information management and disclosure – meeting investor expectations”. Leading British specialists from SRK Consulting, IMC Montan, IGS (International Geoscience Services) Ltd, Behre Dolbear and Wardell Armstrong International Ltd will present at the session advanced geological information management solutions for Encouraging Investment in Exploration and Mining.